A pair of communications satellites was left in a wrong orbit after a botched launch. A Proton-M/Briz-M rocket lifted off on Aug. 6, 2012, at 23:31 Moscow Time from Pad 24 at Site 81 in Baikonur. The vehicle carried a 1,903-kilogram Telkom-3 for Indonesian company PT Telekomunikasi Indonesia Tbk and a 1,140-kilogram Russian Ekspress-MD2 communications satellites. According to the Russian space agency, Roskosmos, the payload section successfully reached its initial orbit. However after two successful firings of the Briz-M upper stage, its third out of four planned maneuvers failed. According to Roskosmos, in the course of the launch, the payload section was not found in its correct transfer orbit, but a signal from the vehicle was picked up from the "emergency" orbit. The agency said that the engine had operated only seven seconds instead of planned 18 minutes, 5 seconds. The official statement also said that the mission had been tracked by the assets of Roskosmos and Air and Space Defense Forces and referred to the vehicle as a payload section, probably indicating that two satellites and the upper stage had remained connected. A western radar detected a vehicle in a 5,010 by 267-kilometer orbit with an inclination 49.9 degrees toward the Equator. These parameters closely match those of a planned orbit following first two firings of the upper stage. A tracking video released on Aug. 7 showed four objects, representing an upper stage, a pair of satellites and an adapter between them. The external tank of the Briz-M upper stage remained attached to it. The separation of the Telkom satellite from the Briz-M upper stage was scheduled for Aug. 7, 2012, at 08:44 Moscow Time, followed by the release of the Ekspress-MD2 at 09:14 Moscow Time. 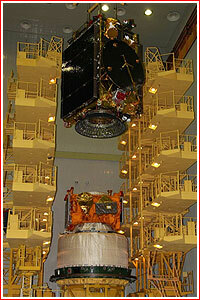 Russian media put a 5-billion ruble price tag on the loss of two satellites. The mission of Ekspress-MD2 was to be insured by Ingosstrakh company for 1,177 billion rubles, while the cost of the satellite development was quoted at 180.08 million rubles. The latest failure took place almost exactly a year after another botched Proton launch left the Ekspress-AM4 satellite in the wrong orbit. Telkom-3 was built by ISS Reshetnev and carried 42 transponders for providing commercial communications across Indonesia and Indochina. It was based on the company's Ekspress-1000N platform. The 1,140-kilogram Ekspress-MD2 satellite was built by GKNPTs Khrunichev with participation of Italy's Thales Alenia Space for the Russian satellite communications company, GPKS. An investigative commission on the failure chaired by the Roskosmos chief Vladimir Popovkin convened in Moscow before the end of the day on August 7. The official agency statement after the meeting confirmed that the engine of the upper stage had not reached operational conditions during the ill-fated maneuver and shot down automatically as a result. Roskosmos announced that O.P. Skorobogatov, the First Deputy Director of TsNIIMash, a leading rocket industry research center, was appointed to lead the commission which included six working groups. By Aug. 8, industry sources at GKNPTs Khrunichev reported that available telemetry from the failed mission had indicated unexplained pressure fluctuations in the pressurization line and the associated helium tank of the pneumatic and hydraulic system, or PGS. The system is critical for forcing propellant from its tanks into the engine. There were apparently several instances of "disappearing" and "reappearing" pressure in the sensor data. On Aug. 9. the investigation commission reviewed available information at GKNPTs Khrunichev, which manufactured Briz-M. In the wake of the meeting, Moscow's Kommersant daily published an article claiming that the launch failure had been caused either by foreign object in the propellant tank which caused a blockage or by a mechanical damage of the "main propellant cable" (an inaccurate term for the propellant supply line). The article also added that the "cable" had had to be re-installed several weeks ago due to technical problems. In the meantime, a prominent independent satellite observer Ted Molzcan reported an increase of the Briz-M's orbit, which had likely been caused by leaks of consumables from the stage. On August 13, the Interfax news agency confirmed that investigators had considered a failure of the pneumatic and hydraulic system onboard Briz-M as a culprit in an August 6 accident. Due to loss of pressurization the fuel would not flow into the combustion chamber. At the time, the investigation commission was to complete its work by August 16. On August 17, Vladimir Popovkin, the head of Roskosmos, publicly disclosed that the third stage of the Proton rocket during August 6 mission had also misfired and only thanks to very reliable operation of its engines it had been able to release the Briz upper stage into an acceptable trajectory. On September 12, the International Launch Services, ILS, (a marketing arm of GKNPTs Khrunichev) announced that a day earlier, Failure Review Oversight Board (FROB) had concluded the review of the Russian State Commission report concerning the root cause of the mission failure. According to the company's press-release, the FROB agreed with the Russian State Commission that the accident had been caused by a component of the pressurization system that was not manufactured to specifications. This caused a shutdown of the Briz-M's main engine by the flight control system onboard the upper stage, just seven seconds into the planned 18-minute and 5-second third burn, ILS said. According to the company, the corrective action plan for all Briz M upper stages that was established by the Russian State Commission and GKNPTs Khrunichev was also approved by the FROB. This included stringent quality oversight of all rework procedures, testing, support equipment, and personnel, both at the Khrunichev production facilities and in Baikonur. In addition, ILS and Khrunichev were to develop specific initiatives to enhance the unified Quality Management System (QMS) that is installed and operating at all Khrunichev's production facilities. "I would like to thank the nine representatives of ILS customers, two insurance underwriting representatives and independent outside subject experts who participated in the ILS FROB process," the ILS Vice President and Chief Technical Officer, John Palmé, was quoted as saying. The return to flight corrective actions were to be completed prior to the Proton's next launch with the Intelsat-23 satellite for Intelsat S.A. of Luxembourg in mid-October. A Russian Federal mission was to follow, ILS announced. On October 23, 2012, a representative of the Air and Space Defense forces, VKO, of Russia confirmed independent reports that the Briz-M upper stage from the mission exploded in orbit on October 16. According to a VKO spokesman, Aleksei Zolotukhin, Russian tracking stations of the KKP network registered 12 fragments associated with the mission, however independent observers had previously counted several dozens of objects.